UDCK supports the expansion of various demonstration experiments into communities including: demonstration of leading-edge researches by universities; and the environmental development and the coordination with communities necessary for demonstrative introduction of new technologies created by companies. We aim at application, implementation, dissemination, and creation of new projects, by connecting leading-edge knowledge and technologies to the life of citizens. The PLS system is a demonstration test for creating a place to foster and connect "the small-scale public qualities of individuals" through the use of unit houses developed by a local company. These small-scale units constantly change in use and location, and are utilized as spaces for spreading information and developing interaction. These include the "Kashiwa-no-ha Smart Cycle" system for bicycle sharing and "Multi-mobility Sharing," introducing electric motorbikes and automobiles. This council, comprised of universities, the government, and private enterprises, was developed when Kashiwa was designated as a Model City for ITS Experiments. Based on its five subcommittees, it currently advances research & development as well as demonstration tests for next-generation transportation systems, including everything from next-generation vehicles to information systems. TEP was established in 2009 as a locally-based community for supporting ventures, making use of the potentials inherent in the universities and research institutes located along the TX line. It founded KOIL (Kashiwa-no-ha Open Innovation Laboratory) in 2014, and provides support to startups on a daily basis. Town Health Center A・SHI・TA was founded in 2014 as a hub for local health promotion based on the activities of "walking, talking and eating." It was developed as part of the efforts to realize health and longevity, as promoted by the public-private-academic partnership, and its management is supported by UDCK. 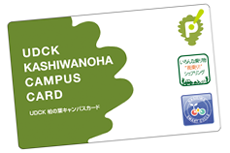 A community card was introduced to enable use and participation in the various projects implemented in Kashiwa-no-ha through a single card. The card aims to improve convenience and promote further community participation. This project, supported by UDCK, is part of a demonstration test for the Plant Factory led by Chiba University. In this project, Plant Factories developed at a small-scale are introduced into areas such as households and restaurants. This council was founded by the public-private-academic partnership with the aim of promoting local activities geared towards preventing global warming. Activities include a CO2 visualization monitor in the household and carbon offset project in collaboration with Kashiwa City and local businesses.